Someone's after Kris Donaldson, and they don't just want her hurt—they want her ruined. First, an arsonist tries to destroy her cabin, and evidence points to Kris. Then an injured deputy is found at her place…with ballistics proof that he was shot with her rifle. Even Trace Randall, the arson investigator who's helped her before, seems to doubt her now. She has to prove her innocence, but how? Her reputation, her life—and her chance for happiness with Trace—are all on the line. Kris Donaldson gripped the unfamiliar set of keys and stared down the winding lane leading to Wind Hill Ranch. It held at least a foot of snow, though far less than the heavy snowpack out in the open areas. Dusk had crawled over the rugged Montana landscape during the long drive from Battle Creek, but she'd been caught up in her disturbing memories and hadn't noticed the fading light. And now, with more snow falling and narrow, twisting mountain roads behind her, it was too late to turn back. She shuddered as she stared over the massive fallen tree blocking access to the property, its roots rising like a tangle of snakes toward the sky. The surrounding pine forest pressed in from all sides, looming fiercely overhead. From somewhere in the gloom came the eerie hoot of an owl, then the terrified cry of some small, unlucky creature. Supposedly there was a house a half mile ahead, but no welcoming security lights glimmered through the pine branches. And though the lawyer had promised to make sure the electricity had been restored, she now had her doubts. "I should have stayed in Battle Creek tonight," she muttered under her breath as she tramped through the snow to circle the twisted roots of the tree. Climbing back in her SUV, she slowly drove over the brush, scraping between two saplings, then angled past a jagged boulder. Despite the SUV's four-wheel drive, the tires spun on the sharp incline. But then they grabbed and the vehicle shot up onto the lane, fishtailing wildly for several heart-pounding seconds. Once she had the vehicle under control, she put it in Park and rested her forehead on the steering wheel until her pulse stopped racing. Then she flipped on her headlights, slipped the gearshift into Drive again and slowly eased down on the accelerator and crept forward, the headlights swinging past an impenetrable wall of pines on either side of the road as she navigated the serpentine curves. The forest abruptly opened up into a small meadow, and she drew in a sharp breath. Ahead, through the veil of falling snow, lay an old, two-story log cabin with a covered porch stretching across the front. There appeared to be several buildings in back—barns of some kind, maybe. Split-rail fencing behind the house trailed off into the deepening twilight. Not a ranch, really—just forty acres—but it was pretty as a Christmas card. The portable dog kennel in the back of the SUV rattled, and her elderly golden retriever whined, scrabbling at the mesh door. "Hold on, Bailey," she called out loudly enough for him to hear. The dog barked a single acknowledgment that made her smile, thankful for his presence. She'd camped alone in remote areas of the Rockies and Appalachians, and she'd lived alone since the end of her ill-fated marriage nine years ago. But she wasn't stupid, and she wasn't foolishly brave. Even after a few courses on self-protection, she didn't take chances. She pulled to a stop in front of the house, carefully scanned it for any signs of life, then surveyed the surrounding meadow before finally unlocking her door and going to the back to let Bailey loose. The dog bounded out of the cage with a joyful yip and ran in ever widening circles, sniffing the ground and raising his head to catch scents on the breeze. He sneezed at the snow falling on his nose, then rolled ecstatically and went back to his exploring. If there'd been any interlopers—human or otherwise—nearby, he would have erupted in frenzied barking. She whistled and he rushed back to sit at her feet, his eyes fixed on hers. "I'm sure glad you're with me," she said, leaning down to ruffle his thick, silky coat. "Let's check out the house before it gets any darker out here." Clicking the door locks of the SUV, she strode up the steps and across the broad porch. A bank of dark, empty windows seemed to stare back at her as she approached. She sorted through the set of keys the lawyer had given her, until one finally worked in the stiff lock. The door opened with a screech of rusty hinges and Bailey rushed through while she patted the wall, found a panel of switches and flipped them all. The porch and interior lights came on, revealing a large great room with a stone fireplace at one end. Ghostly white sheets were draped over lumpy, massive objects—furnishings of some sort—set about the room. A rustic, open staircase rose to a narrow balcony overlooking the first floor. Several closed doors on the second level were probably bedrooms. Straight across the room she could see through a door to the kitchen, while to the right there appeared to be a hallway leading to the other rooms on the first floor. Everything was covered in thick dust and the stale air was filled with the cloying odor of dead mice. A wave of sadness hit her at everything she'd missed after the disappearance of her mother. A home of her own. Relatives. Someone to love her. Yet Thalia Rose Porter had lived here alone all those years, and only in death had she bothered to acknowledge her late nephew's daughter. Just one more sad page among many, though dwelling on the past was useless. Kris cautiously stepped further inside and closed the door behind her, hesitant to lock it until she knew the coast was clear. Bailey bounced up the stairs and sniffed at the closed doors, then raced back down, his tail wagging. She released a pent-up breath as she walked to the center of the room. "Good boy." He romped past her, sniffing at furnishings and old boxes piled in the corner—then suddenly skidded to a stop, his legs tangling in panic as he whirled to stare at the front door, barking furiously. A coyote? A wolf, or a stray dog? Kris heard the crunch of footsteps in the snow, moving fast. Another footstep, this time on the porch. She watched, mesmerized, as the doorknob turned slowly. Her heart lodged in her throat, Kris judged the distance to the entryway, then frantically scanned the room for something. Anything that she could use as a weapon. She spun around, her heart hammering against her ribs as she tried to calculate the distance to the kitchen and a possible escape route out a back door. Oh, Laura—I still miss you so much. But God hadn't stopped Laura's killer, so He surely wasn't going to step in now. Thinking otherwise was a waste of time. Kris turned and started to run for the kitchen. The front door swung open and crashed against the wall. Over her shoulder she saw a towering figure in black fill the doorway, a rifle held against his chest. "Don't move. Don't even think about it, lady." His deep, gravelly voice turned harsh and low. "Unless you want more trouble than you can imagine." She jerked to a halt. Just ten more feet and she could've made it through the kitchen door. Growling, Bailey backpedaled, his toenails slipping and sliding against the slick hardwood floor until he managed to cower behind her legs. "W-who are you?" she managed around the lump in her throat. "What are you doing here?" "I could ask you the same thing," he snapped. "Since you're trespassing on private property. Now turn around—but do it slow." He took a step forward, favoring his left leg as he stepped into the light. His black Stetson cast his face in shadows, but now she could see his broad shoulders and his big, capable hands holding that rifle with an easy confidence that made the weapon seem like an extension of himself. She had the gut-deep feeling that if he chose to shoot, he was a man who would never, ever miss. "I—I live here, now," she explained. Her voice sounded high and breathy, even to her own ears, and she swallowed back her fear. She slowly reached into her jacket pocket. "Don't. Move." He snarled each distinct word. Bailey gained courage and edged from behind her legs, his growls deepening. "And keep your dog there, lady. Don't make me do anything we'll both regret." Turning slightly away, she reached down for the dog's collar and gripped it tightly to still her trembling fingers, easing her other hand into her pocket for her cell phone at the same time. Pressing the "1" would speed-dial 911. But did 911 work out here? Was there even any reception? Surrounded by massive granite mountains and towering foothills between here and town, maybe not. And would the local sheriff bother to follow up if she surreptitiously dialed but couldn't talk? Did he even have the capability to pinpoint this place via cellphone towers in the area? The weight of fear and helplessness gripped her stomach in a painful knot. Despite the cold, sweat trickled down her back. The intruder pushed back one side of his full-length Australian outback coat and unclipped his own cell from his belt. Without taking his eyes from her face, he hit a single speed-dial button, then held the phone to his ear. His words stunned her, filled her with sudden hope. "…and I need you out here right away. I just caught another one of those vandals, and you won't want to let this one get away." Trace Randall scowled at the woman as he snapped his phone shut. He'd seen the dark SUV slow down far ahead of his truck, as if the driver was searching for an easy mark. When it turned up the road to the old Porter place, he'd known his instincts were right. Thalia had been gone for over a year. Six months ago he'd discovered a wild drunken group of teens partying in her barn, and thieves had broken into the cabin just last month, though he and his cowhands had scared them all off before they'd had a chance to do much damage. Set so far back from the road, the place was an attractive lure to those who wanted to avoid watchful eyes. He'd known it would only be a matter of time before trouble struck again. That anyone would come out here, under cover of approaching darkness, to steal dear old Thalia's possessions gave him a serious case of heartburn. But that the thief was a young woman this time flat-out surprised him. Though she was bundled up in a heavy coat, her hair hidden in a stocking cap, she didn't look like she was more than thirty—if that. And though her face was chalk-white at being caught in the act, she looked halfway attractive. What was this world coming to? "Y-you called the sheriff? Really?" she whispered. The note of hope in her voice made him pause. "You heard me. He's sending out a deputy, and fortunately the guy isn't too far away." Her shoulders sagged with obvious relief, and she reached up to pull off her stocking cap. A cascade of sun-streaked blond curls rippled across her shoulders like warm honey. "Well," she said with a sigh, "if that's the truth, I can't tell you how glad I am to hear it." Despite her casual words, she took a cautious step back, and then another. "I wouldn't try to leave, if I were you." "It's you who'll be leaving once that deputy gets here." She leaned down and murmured something to the dog, then released her hold on its collar. The dog sat at her side, its eyes riveted on Trace. "This place belongs to me now. I've got the attorney's letter about the inheritance in my truck." He narrowed his eyes. "Which attorney? From where?" "Carl Baxter. He has a satellite office in Battle Creek. I met with him at his main office though… down in Lost Falls." Anyone could have had that information ready as a cover. "He was Thalia Porter's attorney," she added. "He handled her will." "How long ago did she die?" The woman lifted a shoulder. "January of last year, I guess. I never met her. I only heard about it a few months ago." Her story sounded more implausible by the minute. Trace glanced at his watch, wishing the deputy would hurry up. There were cattle to feed and horses to bring up from the pasture back at the ranch. And if he was lucky, there might even be a hot supper warming in the oven if his sister, Carrie, had gotten back from Billings. "So you never met Ms. Porter and didn't know she'd died. Yet she left you her property?" "Strange, I know. Supposedly she was my great-aunt, so surely she must have known about me. I keep wondering why she never bothered to track me down. I was left in foster care from the age of ten, and I guess now it's too late for any answers." A thread of anger and hurt simmered in her voice. "Until recently I didn't even know she existed. Go ahead—search my truck and find that paper. And while you're at it, check out everything else in there. If you think you're going to find stolen goods, you'll be sadly mistaken." From outside came the sound of tires crunching through the snow, and Trace rocked back on his heels and smiled. "I guess we'll find out pretty soon. And if any part of your story isn't true, I imagine you'll be seeing the inside of the Latimer County Jail." WOW!! This sounds like a great mystery/suspense and I would love to read. 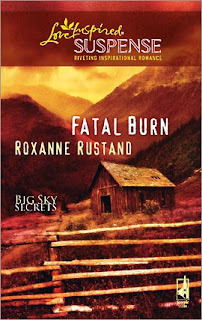 Roxanne's a great writer--I always enjoy her books!